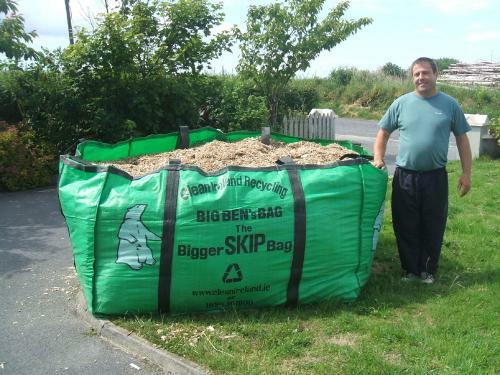 “Big Ben’s Bigger Bag” from Clean Ireland Recycling offers a low-cost alternative to conventional standard skips. It comes neatly packaged in a small plastic bag. Use it when you want to, just contact us when it’s full. Conventional skip trucks are limited as to where they can drop or pick up skips or skip bags. Clean Ireland Recycling uses specially designed trucks with long reach cranes offering much more flexibility to you the customer. Price includes Collection and Disposal. Not suitable for heavy builder’s rubble. 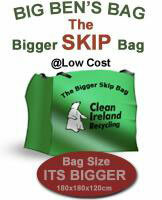 “Big Ben’s Bigger Bags” are available by ordering online or at any of our offices in Ennis, Limerick, Shannon or Cree. Click here for our office addresses. If you would like a “Big Ben’s Bigger Bag” delivered to you, please complete the order form and we will deliver within 48 hours. If you already have a “Big Ben’s Bigger Bag”, please complete the order form and we will arrange collection within 7 days. When you receive your “Big Ben’s Bigger Bag”, please be sure to read all the instructions prior to filling. Ideal for larger Spring clean or attic/garage clear out, DIY, Medium size home or building renovations, etc. SAME SIZE AS STANDARD SKIP BUT AT A FRACTION OF THE COST. Prepay online to avail of discount. Big Ben’s Bigger Bag must be prepaid before collection of bag in office.